Tweet Evidently, a lot of people do. Everyone keeps praising the pregnant woman who ran the #ChicagoMarathon. Anyone think that wasn't such a great thing for her to do? Some of the responses she got made me realize how many people are coming down hard on this mom for her "reckless" and "irresponsible" decision to "run" a marathon at 39 weeks of pregnancy. Not just, "I wouldn't do it" or "I don't think she should have done it" but people seriously calling her "reckless," "irresponsible," "selfish," and "risky." In case you didn't catch the news coverage, Amber Miller got clearance from her doctor & support from her husband to run half the marathon & walk half the marathon at 39 weeks of pregnancy. Obviously, she didn't just up & decide to run a marathon. She is in excellent physical condition and had no contraindications to continuing her physical activity during pregnancy. I'd like to point out that my Google news search for "chicago marathon birth" on 10 OCT 2011 turned up more articles about the winner of the marathon & the firefighter who died than it did for the woman who gave birth. She was mentioned in a few articles, but only rarely mentioned in the titles. Why is this a big deal? I wasn't in condition to run a marathon BEFORE I got pregnant, so it would be asinine for me to do so while pregnant. Personally, I think running when you aren't being chased by a knife-wielding maniac is pretty crazy, but I'm a lazy sloth. Other women have continued to train for marathons while pregnant, so this isn't anything new. The key point is that your activity level during pregnancy is individual to you. I was walking 3 miles a day towards the end of my pregnancy with no issues. Some women are on modified bed rest. I am not going to judge another woman's pregnancy needs based on my own. Most people understand difference between discussing/debating a controversial issue (which I greatly enjoy). However, when I see words like "irresponsible" and "selfish" coming up repeatedly, I tend to think it's no longer a discussion but a judgment. It would be very irresponsible for ME to run a marathon ever at 39 weeks, but it's not irresponsible for everyone, as evidenced by Amber Miller. 1- I ate sushi while pregnant. 2- I cleaned the litter box while pregnant. 3- I had half a Guinness while pregnant. 4- I ate soft cheeses while pregnant. 5- I took zoloft while pregnant. 6- I did not get the seasonal flu or swine flu vaccine while pregnant. 7- I slept on my back more than once while pregnant. 8- I went to a party, wore heels, & met Donald Rumsfeld the night before I went into labor. 9- I labored at home for several hours after my water broke. 10- I hired a midwife and not an OB. For each of these things (okay, maybe not meeting Rumsfeld, I just like to throw that in whenever I get the chance), I was told by at least one person that I was being selfish and putting my baby at risk. I never asked for anyone's opinion, but my growing belly made some people think they needed to tell me exactly how irresponsible and negligent I was being. Guess what? I have the right to make decisions concerning my own body. Just because a woman is pregnant does not suddenly mean that she loses the right to make her own decisions. Random members of society don't get to make these decisions for me based on what they think I should do. In fact, unless I'm declared mentally incompetent, no one gets to make decisions for me. This kind of thinking worries me because it can lead to pregnant women being forced into birth interventions, surgery, or tests without their consent because someone else deems the mother's right of refusal invalid due to her being pregnant. It can throw us back decades with women's rights. the New Jersey appellate court found that V.M. and B.G. had abused and neglected their child, based on the fact that the mother, V.M., refused to consent to a cesarean section and behaved erratically while in labor. The mother gave birth vaginally without incident, and the baby was "in good medical condition." Then she was never returned to her parents, and the judge in the case approved a plan to terminate their parental rights and give custody of the child to foster parents. Melissa Ann Rowland stands charged of murder by the State of Utah forfailing to permit a timely cesarean section that could have saved one of her two babies from in utero death. Her case demonstrates the classic maternal-fetal conflict: Mrs. Rowland refused to consent to a procedure that had substantial risks for her and no benefits, but which could have saved her stillborn child’s life. The charges represent the farthest extent of state action in favor of fetal rights over maternal autonomy and proceed against a jumbled background of contradictory precedents. These were just two examples and the facts surrounding the cases are murky but the charges were brought against these women due to their refusal to do what someone else decided was best for them. This leaves a really bad taste in my mouth. It tastes like paternalism & misogyny. I'm going to step off my soap box now but I'd love to hear your thoughts on this. Do you think women lose their autonomy upon getting pregnant? Should doctors/caregivers/loved ones have the authority to overrule a pregnant woman's decisions regarding her body? Tweet No, I'm not constipated. I gave up commercial shampoo for a week, commonly referred to as "no 'poo." Clever, eh? I have never found a shampoo that really works well for me & my hair. I even used "Thicker, Richer, Fuller" for a while but it was pointless. My hair is very thick, very straight, & very heavy. When the natural oils start to flow down (which is about 5 minutes after I wash it), it becomes a thick, heavy, boring, lifeless mess. Over the past couple of years, I started hearing about a lot of people doing the whole "No 'Poo" thing and, well, I scoffed at them. I mean, sometimes I'll go several days without washing my hair but it's not on purpose. It's just gross, right? Wrong. In fact, my snap judgment couldn't have been MORE wrong! I'm so glad I challenged myself to give up shampoo & conditioner for a week to see what all the crunchtastic hype was about. My hair was fuller & less oily with the baking soda rinses. It felt limp when I washed/conditioned it but was super shiny. My hair was, again, awesome when I used baking soda the next night. I won't be switching 100% to baking soda right now, but I will be cutting back on shampoo/conditioner. I have been very pleased with the results and I continue to space out my shampooing with baking soda rinses. I definitely recommend giving the baking soda rinses a try if you have hair similar to mine. Have you tried "no 'poo"? What were your results? Any other "no 'poo" tips for other hair types? *note that many "No 'Poo" instructions use vinegar. I don't. I can't. It reminds me of that time I had head lice and I want to vomit. Tweet We are from The South, so college football is only slightly less important than God & family. Our friend, Crystal, found a recipe for delicious chicken wings in Gourmet Magazine (December 1999 ed) and cooked them for a party a few years later. Everyone fell in love with her the wings, so she shared the recipe with us all. It has since become a staple college football food for us and Chris is the master chef. Wings can be served hot or at room temperature. -We have successfully halved the recipe for smaller groups. -Watch the time during the second half of baking. We have used four different ovens, electric & gas, with this recipe & they all required slightly different cooking times to avoid "blackened" wings. -This particular recipe can be rather messy, so if you are opposed to using disposable roasting pans, please allow yourself several hours to clean, which is fine if you hate football. 1) Are you ready for some football? What is your favorite tailgating (or couch-watching) football food to make? Tweet I have to say, right off the bat, I love this place. 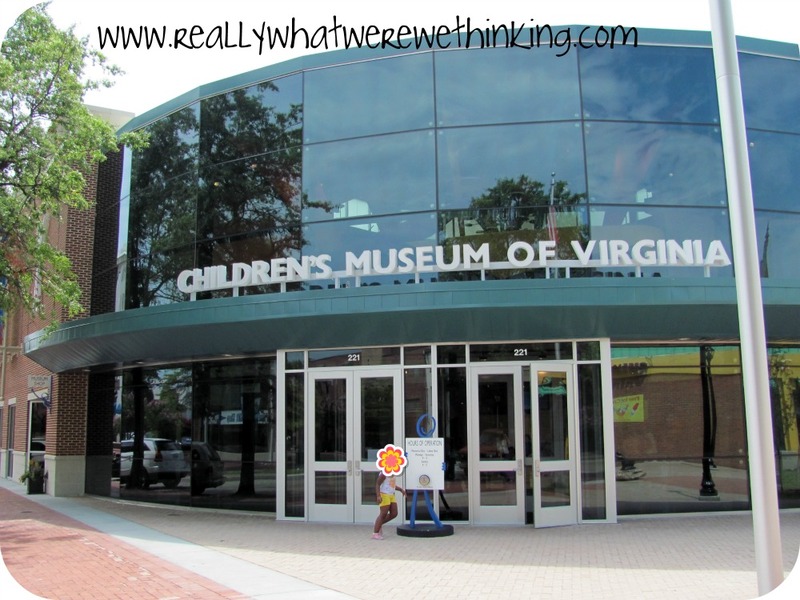 Shortly after we moved to Virginia, the Children's Museum in Portsmouth closed down for a remodel that was supposed to make it better than ever. I have no idea what it used to be like because I don't hang out at places like Children's Museums or Chuckie Cheeses without kids. However, I am impressed with what it is today. There are two levels. 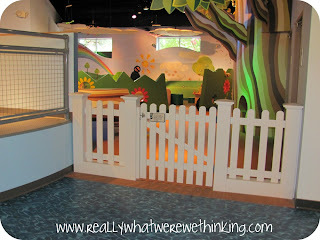 The entrance level contains the majority of the stuff that will be interesting to younger kids and toddlers. Much of it will also be interesting to older kids because it's just neat. There is a section and a half devoted to trains, complete with a running rail system with areas kids can crawl into & get a great view of the action. Off to the side of the main train room is a Thomas the Tank Engine play area. 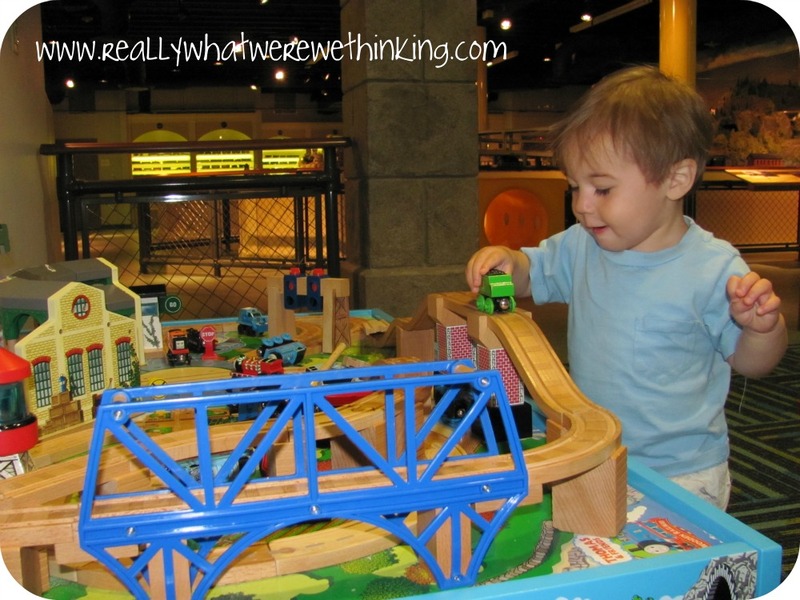 There are two train tables, one with attached tracks and the other left free for kids to build their own track system. There are TONS of trains. Klaw absolutely loves this area. 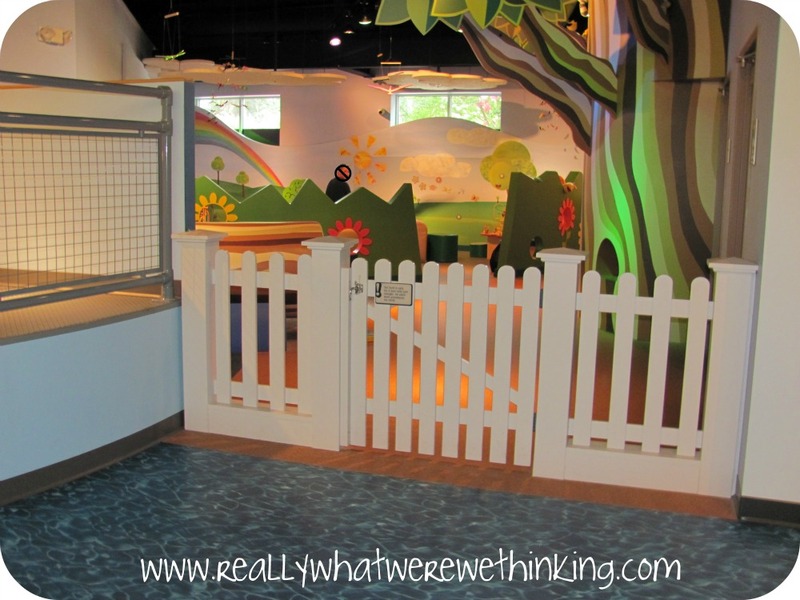 Klaw's other favorite area on the first floor is the toddler play area. It's a good place to hang out if your toddler is getting overwhelmed or if there are school groups/big kids running amuck. It's kind of removed from the main area, so it's quieter. It's also enclosed, so you can let your toddler play at will. There is a conveniently located family restroom and a nursing room in the area. 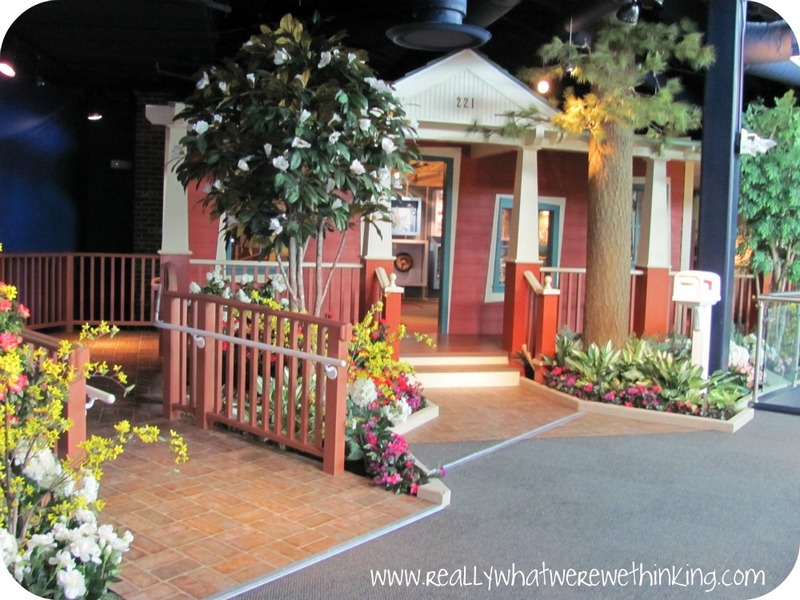 You can also find a grocery store, veterinary hospital, loading dock, bank, doctor's office, HRT bus, fire truck, police motorcycle, plus a few other fun attractions down stairs. 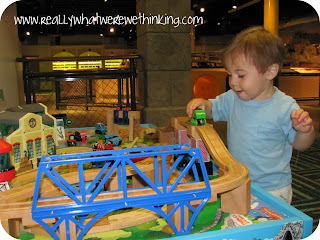 If there are a lot of older kids, it can be loud and overwhelming for Klaw, which is why we spend a lot of time in the toddler area and the train area. 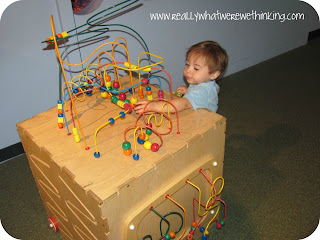 Upstairs, the activities become more geared towards older kids with science & art taking the stage. 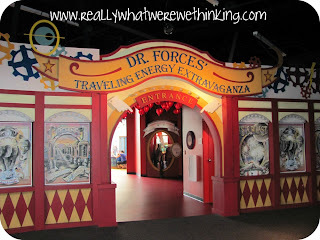 Younger kids can definitely enjoy the exhibits but older kids (and adults) can learn (or remember) physics & math while having fun. I really enjoy the house that demonstrates energy usage and ways to save & recycle. 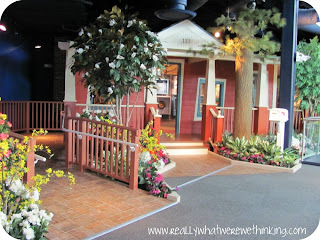 It meanders out to a "yard" showing different habitats and animals (not real!). There are things to crawl through for the younger kids and interesting facts for those of us who don't crawl so much anymore. 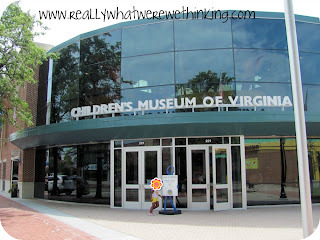 The Children's Museum of Virginia really does have something for everyone. We ended up buying an annual membership because it is something I can take Klaw to every couple of weeks and it doesn't get old for him. The price per visit is a little steep if you plan to go more than a couple of times of year, so it's worth looking at a membership if you are local and your kids like it. 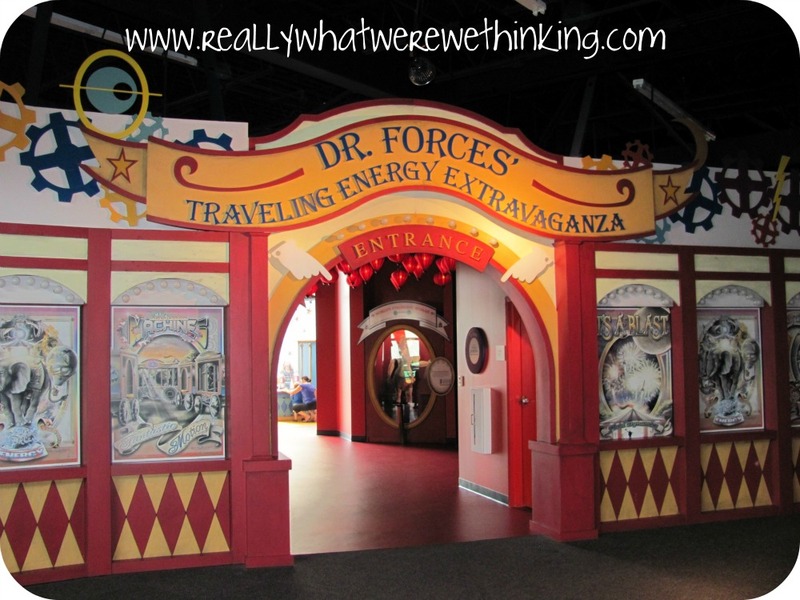 Are there any "go-to" museums or parks your kids enjoy? What is your favorite place to take your kids that you enjoy, also? Tweet I'm not really into having a "song." I know lots of couples have their special "song" that is the soundtrack of their love...blah blah blah...I just don't understand it. I might make fun of it; I might be jealous. I'll let you decide. I have had a couple of songs that I've considered my own personal anthems throughout my life. I still want to fist pump whenever I hear them. I may roll down my windows and shout the lyrics like it's my job if I'm driving. Can I get an "AMEN"??? That stanza will be memorized by Klaw right after The Lord's Prayer & The Apostle's Creed. Yes, Whitesnake, people. Whitesnake is the awesome. I know that may seem a little sad at first BUT I was single and absolutely loved it. I had no plans to get married. Nope, not for me. The older I got, the less the thought of being shackled to someone appealed to me. I was also living in Charleston and it is REALLY EASY to be single and love your life in Charleston. Gah. It may actually be harder to have a successful committed relationship in Charleston. Oh, fun times. What are some songs on your life soundtrack? Any songs that are the anthems of your past??? Which song do you think should be my "new" anthem? This post is inspired by 2.) Tell us about your song.